Winners of NetRiders Skills competition for Vietnam in 2010 - Nguyen Thai Nguyen, Ha Duc Cuong and Trinh Tung Anh from Bachkhoa Networking Academy at the Hanoi University of Technology Hanoi University of Technology. 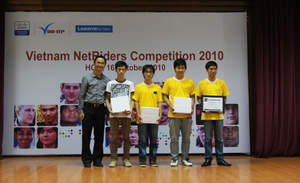 The participants of NetRiders Skills competition for Vietnam in 2010. The network has become a critical platform in helping businesses increase productivity and drive innovation. To leverage on the benefits of technology that can sustain business longevity, businesses need highly skilled and experienced employees. Being equipped with ICT skills of the 21st century gives today's students an edge in their career as network managers of the future. It will help them strategize the implementation of next-generation technologies that contribute to business growth in Vietnam and as a next step, the global economy. HO CHI MINH CITY, VIETNAM--(Marketwire - October 19, 2010) - Cisco (NASDAQ: CSCO) today announced that it is investing in the future of Vietnam by collaborating with educational institutions through the Cisco® Networking Academy®. This collaboration aims to create a highly skilled workforce that support the demands of the information and communications technology industry and serve as a catalyst for socioeconomic development in Vietnam. With more than 900,000 students worldwide in 165 countries, the Networking Academy is a global education program that teaches students how to design, build, troubleshoot and secure computer networks for increased access to career and economic opportunities in communities around the world. 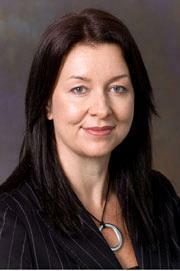 "The network has become a critical platform in helping businesses increase productivity and drive innovation. Countries around the world are using next-generation networking technologies to improve business efficiencies, raise their competitive advantage, and bridge the digital divide. To take advantage of the benefits of technology that can sustain business longevity, businesses need highly skilled and experienced employees," said Lee Chiang Toh, country manager for Cisco in Vietnam. In Vietnam, the Networking Academy delivers a comprehensive 21st-century learning experience to close to 7,300 students across 22 academies, helping students develop the foundational ICT skills needed to design, build and manage networks, along with career skills such as problem solving, collaboration and critical thinking. Students complete hands-on learning activities and network simulations to develop practical skills that will help them fill a growing need for networking professionals around the world. The Networking Academy in Vietnam has successfully completed two internship programs since 2008, giving 27 students the opportunity to put their skills into practice at Cisco and Cisco partner offices for nine months. During this internship, Cisco also sponsored its CCNP® professional certification for the students. In addition, the curricula, CCNA®, CCNA Discovery and CCNA Security certifications, which align to the recognized industry certifications, have been integrated into the main curriculum in universities. "Through the Networking Academy program, we are committed to developing the right technical expertise, particularly in fast developing countries like Vietnam. Students learn both ICT and other 21st century skills which give students an edge in their career as networking professionals of the future. It will help them strategize the implementation of next-generation technologies that contribute to business growth in Vietnam and as a next step, the global economy. 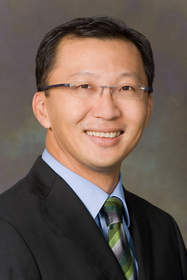 Companies will be able to reap the expert knowledge on ICT best practices to build and deliver the right technologies, services and profitability programs that can support and accelerate their business," said Sandy Walsh, regional manager for Cisco Networking Academy in Asia Pacific. As part of the Cisco Networking Academy program, the NetRiders Skills competition is an annual affair that provides students with an opportunity to transform their classroom knowledge into practical skills. At the same time, it creates a platform for their knowledge and proficiency to be recognized in the information and ICT industry. The Vietnam NetRiders Skills 2010 competition, held today at the Vietnam National University - IT Park saw 45 students complete a theory and practice assessment conducted online. Leading-edge e-learning systems and Cisco's Packet Tracer software were used to simulate a live network that the students could test. The winning team Nguyen Thai Nguyen, Ha Duc Cuong and Trinh Tung Anh from Bachkhoa Networking Academy at the Hanoi University of Technology was rewarded with a certificate of achievement and products from the Cisco Consumer Group. The winners will also represent Vietnam in the upcoming Cisco NetRiders Asia Pacific competition, where more than 15 countries are expected to compete. The team from Malaysia won last year's Cisco NetRiders APAC competition and went on an all-expenses-paid trip to the United States. The ICT training and education represents Cisco's commitment to help Vietnam develop its information and human capital infrastructure to keep pace with global ICT developments. The Networking Academy works with public and private organizations to promote socioeconomic development through increased access to ICT resources, education, and career opportunities. Launched in 1997, Cisco Networking Academy is a collaborative partnership between Cisco, education, business, government and community organizations around the world, aimed at nurturing IT professionals. The education program employs an e-learning model, using a combination of Web-based and instructor-led training along with a hands-on lab environment to teach students how to design, build and maintain computer networks. , more than 3 million students have participated in the program from a total of approximately 10,000 academies in more than 165 countries. Cisco (NASDAQ: CSCO), the worldwide leader in networking that transforms how people connect, communicate and collaborate, this year celebrates 25 years of technology innovation, operational excellence and corporate social responsibility. Information about Cisco can be found at http://www.cisco.com. For ongoing news, please go to http://newsroom.cisco.com. Cisco products are supplied in Vietnam by Cisco Systems International, BV, a wholly owned subsidiary of Cisco Systems, Inc.
Cisco, the Cisco logo, Cisco Systems, Networking Academy, CCNP and CCNA are registered trademarks or trademarks of Cisco Systems, Inc. and/or its affiliates in the United States and certain other countries. A listing of Cisco's trademarks can be found at www.cisco.com/go/trademarks. Third-party trademarks mentioned are the property of their respective owners. The use of the word partner does not imply a partnership relationship between Cisco and any other company. This document is Cisco Public Information.